Investors would be easily forgiven for exhibiting elements of fear and trepidation when it comes to investing in stockmarkets. History has taught us that investing, in particular the equity genre, is laden with episodes of crises, crashes and volatility. By nature, stocks (aka equites) are risky investments relative to other major asset classes. This is due to the fact that they are the lowest-ranking component of a firm’s capital structure. Put another way, equity investors are last in line to receive the net proceeds of a company in the event of liquidation. Why then would one invest in such a risky asset when safer harbours are close to hand? The answer, according to hundreds of years of historical evidence, is that over the longer-term equity investors are compensated for carrying that risk. Equities may stand at the end of the queue in the event of insolvency, however, when shareholders retain an ownership stake in the underlying firm, they are first to claim the firm’s net profits. 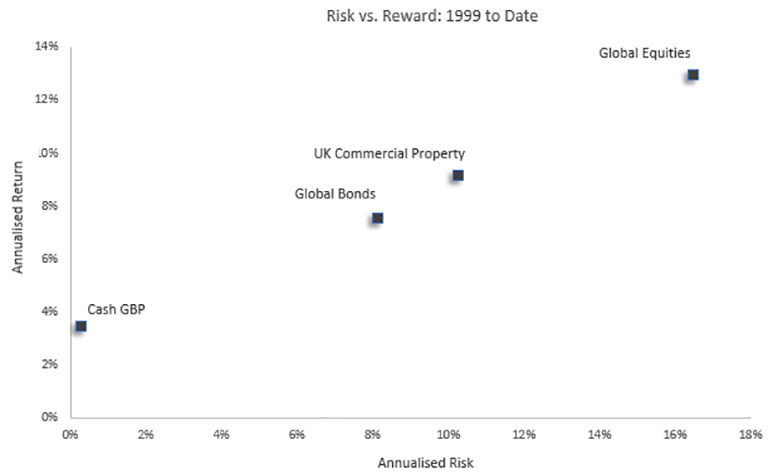 To illustrate this point, we provide the below chart which shows annualised risk and return data in GBP terms for cash, global bonds and global equities. One can clearly see that equity investors are the clear winner in terms of returns achieved over the period; having well-outpaced those invested in bonds (which are debt instruments and offer no profit participation) and, unsurprisingly, those sat in cash. Constituent Indices: GBP 1-month LIBOR, Barclays Bloomberg Global Aggregate (GBP-hedged), IPD UK Property, MSCI World (GBP). Source: FE Analytics. Given the inherent risks associated with equity investing, a number of our clients have expressed concerns regarding the potential for an impending market drawback. As the future is of course uncertain, we cannot be sure as to the timing nor the magnitude of future market corrections. We can, however, provide our clients with evidence regarding the value of long-term investing. Data would suggest that patience, calmness and perseverance have been highly-effective investor traits over the years as opposed to those who employ frenetic and panic-driven trading strategies. We provide the below logarithmic chart as evidence of this phenomenon. 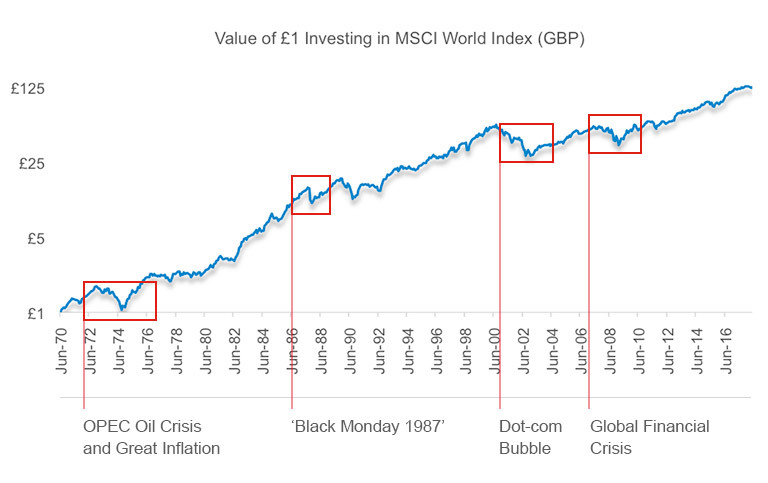 It displays the returns to a Sterling-based investor who invested £1 into the MSCI World Index (a global, developed-market equity index consisting of approximately 1,650 stocks weighted by market capitalisation) from 1970 to date – assuming reinvestment of dividends along the way. 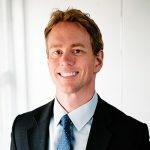 Although 48 years is, in the majority of cases, well beyond what would be considered a standard time horizon, it serves to bolster the argument behind long-term investing as the initial £1 investment would be worth approximately £125 today – a return of circa 12,400% (excluding inflation). We have highlighted various market drawdowns along the way which at the time were the cause of significant stress to many investors. However, when these events are presented over the longer term, these drops appear much less pronounced and are more akin to speed bumps as opposed to cliff falls. It is also evident that the constantly invested individual would have been well-rewarded for having the discipline to remain invested during these periods of volatility. This may not come as any relief to investors with time horizons less than 48 years and, with that in mind, we will examine evidence which focusses more on the modern era. The grey column represents the constantly-invested individual, who achieved an end value of £42,500. The proceeding blue columns represent individuals who, as a result of disinvestment, missed the best 10, 30 and 50 days of index performance respectively. Even the investor who ‘only’ missed the 10 best days was 50% worse off than he or she who remained invested throughout the entire 20-year period. A final piece of evidence we offer, focusses on market timing. The below chart displays the end-wealth of five separate investors when investing $2,000 per month into the S&P 500 index (an index consisting of the 500 largest American companies by market capitalisation) between 1993 and 2012. Were one able to consistently achieve perfect market timing, this individual would of course be better off versus his or her peers; however, to invest with perfect timing every month over a 20-year period is, frankly, impossible. The critical message resulting from the study was that even an individual with consistently-poor market timing was considerably better-off than their disinvested counterpart. Fortunately, investing available funds immediately upon receipt, or at regular monthly intervals are investment strategies which can be easily followed. We would note that all of the aforementioned facts and figures pertain to investments in individual equity indices. As a standalone, this would be considered a highly risky strategy as equity returns can be unpredictable over the short-to-medium term. Subsequently, we would always recommend that a more diversified portfolio which also holds less volatile asset classes is a key and often necessary consideration for most investors. We also believe that investing is a long-term process and that the longer one remains invested, the greater the probability of achieving positive returns.